We spend most of our time creating brands for others. And as much as we love our clients, sometimes it feels good to flex our muscles freely. Also, we love food, and are particularly obsessed by the glorious heirloom tomatoes grown by Billy Allstot in Wenatchee, WA, with a brix factor that is off the charts, and a rich complex flavor that we crave during the eleven months a year when they’re not in season. And thus Tomato Goodness was born. We knew from our food experience that we couldn’t be the only ones who would happily pay $9 for a jar of gorgeous succulent local heirloom tomatoes, canned at peak. 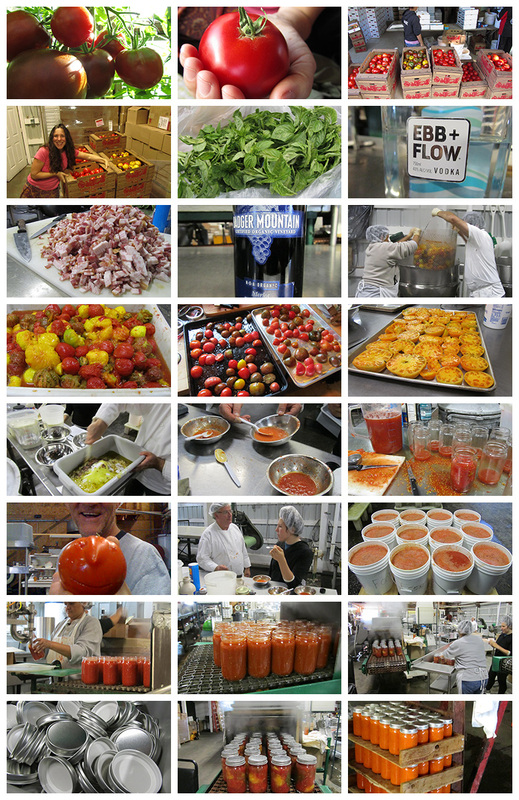 So we decided to take a journey into the world of end-to-end creation, building the Tomato Goodness product line and brand from scratch. 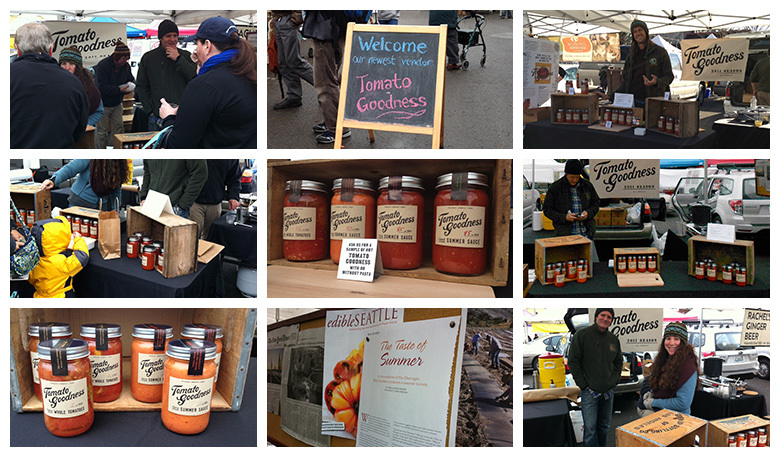 We dove into new universes — sourcing, co-packing, commercial food production, scaled recipe creation, and the intricacies of the somewhat clannish Seattle farmers market scene (in winter!) We got our hands wet and tomato-y. We designed, built, and worked the booth, sampling sauces on hot pasta in the wintry chill, assessing consumer feedback all the while. And we sold out in just five weekends — five times faster than we’d projected. On our last market day, loyal customers begged for more, and as we sadly told them no, we smiled to ourselves, in the ultimate moment of personal triumph for branders on a busman’s holiday. The packaging and brand elements were conceived out of the place in large part. The Okanagan Valley, where our tomatoes are grown, was famous for it's canning of fruit (stone fruits) and tomatoes in the early 1900s, pre industrialized food. 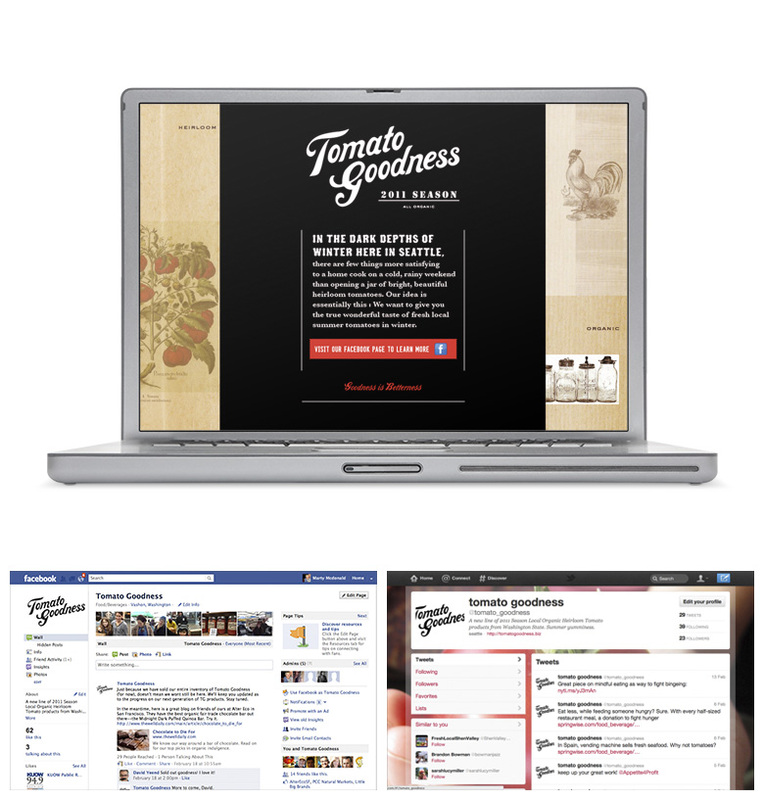 We wanted to evoke this "time-gone-by" affect, when food was simpler and more pure. The design cues the sensibilities of a 1920s grocery store, from the specialized fonts, craft paper and letterpress printed labels, to the glass jars and hand-applied lid bands. A wholly unique approach to our marketing strategy was to brand the season's product as a "vintage," not unlike wine, to celebrate the unique expression of the season's crop and ingredients, and the product's specialness and limited availability. Continuing the theme of the brand, we drafted design off of early advertisements with their busy and expressive qualities! This gave us the opportunity to go long-form, in the opposite direction of modern advertising, where everything is crystallized into lowest common denominator soundbites, and belabor the ingredients and flavors, farmer stories, nutritional benefits, ingredients(long form, too), and just about anything else we thought people would read. We developed a modern outreach strategy for this "harkening back" brand, with a website that fed a Twitter feed and Facebook page. Once word got out locally, the social foodie channels were abuzz, which all served to merely quicken the diminishment of our limited inventory (1200 lbs). Some production images, as we sourced, procured, blended, tasted, cooked, co-packed, shipped...and slept little. While famous for their lengthy wait-lists, the two major winter markets in Seattle — Ballard and University — accepted us immediately on the basis of our product concept and its relevance to their mission of developing local food systems. We designed and built our booth, merchandised and sampled like crazy, met a ton of the coolest market folks you could imagine, and sold out of our last jar 5 weeks after starting.